Kadokawa has launched a campaign to celebrate the upcoming releases of Kobato. and Wish! The campaign consists of earning points and exchanging them for a 15 cm Ioryogi plush strap. The points will be available on the comics of Kobato. and Wish new version. A total of 1000 prizes are available. Also good news! The release date of Kobato. #4 was announced! It will be released on December 26, a year after the release of volume 3. Still on Kobato., Kadokawa has a special pre-order page for the 2010 calendar here. Lastly, Kadokawa will release a new book called ALL ABOUT CLAMP. This will be the book version of the special magazines CLAMP Newtype that were first published in 2006. 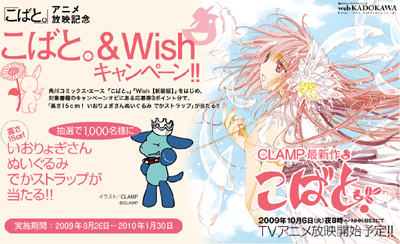 The magazines carried information on all of CLAMP’s works, from RG Veda to Kobato., among from other contents. The uncompilled portion of X known as volume 18.5, first released with CLAMP Newtype [PLATINUM], will also be included in the book. ALL ABOUT CLAMP will be released on October 24. Wow, that’s a lot of stuff. And grr, I wish Kobato got new volumes more often, heck I just want more of Kobato! It’s amazing how much attention it’s getting. It may even get as massive of a franchise as CardCaptor Sakura. Of course I’m not sure if they can really play off anything as much as the whole almost tarot card thing that they did in CardCaptor Sakura. I bet they’ll try to release ALL ABOUT CLAMP over here too. And I’d totally buy it if there’s a translated 18.5 coming with it. Which reminds me that I wanted to check the status on Kobato. — they mentioned sometime ago that they’d like to release it in Germany but back then there were no tankobons yet. Hmmm. Yup! They tend to buy all kinds of extra stuff licenses so my hopes are reasonably high. That’s HUGE! *__* Artbook size! Hmm… sorry to ask this but did they ever publish the X 18.5 in English officially? Wait, there’s a Wish remake?? ;O; Or is it just a re-release? I wanna seeee. Just a re-release with new covers. I have this feeling Kobato is going to be the new Cardcaptor Sakura. Not too excited about ALL ABOUT CLAMP either. It seems to be a copycat of CLAMP Newtype. Thanks for the news! Ah, I’m so excited for the anime, it looks like it’s going to be great! Those are really nice news. Thanks. The uncompiled portion of X known as volume 18.5, first released with CLAMP Newtype [PLATINUM], will also be included in the book. That’s great, but it makes me less hopeful for a continuation of the series. It really does make me wonder if Ms. Ohkawa now dislikes the ending she planned, and is having trouble writing another one. I’ve got high hopes for Kobato, though! I don’t think it’s quite right to say that it’s going to be the next CCS, since they’re such different series, but I’m sure that it’s going to be a wonderful success. I have no idea what I’m doing on the Calender order page, that and Google Translator is, of course, no help at all. THE NAME OF THE SONG – OP THEME “IS MAGIC NUMBER”!!! In Maaya’s site they update the single info! I should be happy for the All About Clamp Book but i’m not they could have used this book to give us new chapters!And that makes me sad…. OMG!!!! All About CLAMP? Nyaaaaaaaaaaaaaaaaaaaaaaaaah! How I wish to learn japanese right now! First of all, thanks a lot for the news ^o^ I’m always looking forward to your entries~ Please keep up your wonderful work! ALL ABOUT CLAMP will be released on October 24?! ?